Now here's something a bit different. An art exhibition entirely devoted to eels. 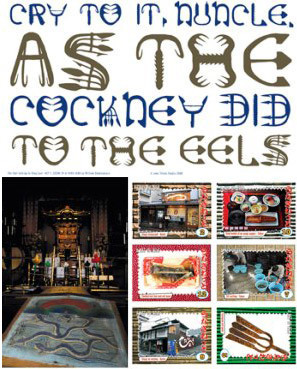 This is a bi-lateral project - Japanese Kyoichi Tsuzuki, an acclaimed photographer, and Londoner Jake Tilson, artist-author-cook, have teamed up to celebrate this most peculiar of fish and its cultural significance in both the UK and Japan. Tilson (who incidentally is the son of Joe Tilson) is noted for his culinary exploits: it is hard to determine whether his first book, A Tale of Twelve Kitchens, is a work of art first and foremost or a cookery book. Add in his love of typography and presentation, and you've got food as you will never have thought about it before. Expect a humorous and affectionate take on all things anguilliform. Tsuzuki is already known for his gentle photographic parody, and his reflections on his country's huge consumption of eels (half the world's intake) are bound to raise smiles and eyebrows. The exhibition runs at the Wapping Project from 10th July - 23rd August, 12 noon - 10.30pm. A worthwhile trip East, in every sense.